Once a laminate floor is installed, the main work is done. There is always necessary maintenance and care that prolongs the life, appearance, beauty and function of the floor. 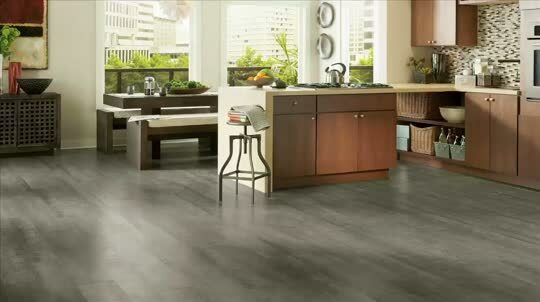 Laminate floor care is centered on the protection of the wood surface, as the most common flooring is wooden. It is important to recall that wood is easily ruined by a prolonged exposure to moisture. Wood flooring must be protected, and treated as recommended by the manufacturer. Laminate wood flooring is no different, and careful attention should be paid to the recommendations, however this will be a discussion about the general care of laminate floor. The initial step to protecting your new floor is a simple cleaning exercise. A wood floor, prior to any treatment, should be swept or vacuumed free of debris. The floor should not be mopped or washed, again avoiding contact of water with wood. The laminate floor can be cleaned with specific cleansers, but other abrasive products or materials should be avoided. The concept of sealing & cleaning the floor is controversial, since laminate boards have a top seal. The only aspect of the floor that is subject to moisture damage are the small to nonvisible gaps between the boards. A sealant would then cover the minute openings between the boards. There is no known length of time that such a sealant is effective, and there is no knowledge that the process will prolong the life of the floor. For this reason, the installation process is critical as the boards need to interlock and move as little as possible to avoid such gaps. Keeping the floor dry is always imperative. Spills onto the floor need to be caught and immediately wiped up with a clean nonabrasive cloth. Eliminating the moisture before it causes the wood to swell, warp, and expand is critical. When other substances such as paint, marker, ink etc. cause spots on the floor, the spot should be lifted as soon as possible. When the spot is dry, it can be softened most often with acetone on a cloth. Solid dried areas can be softened with rubbing alcohol as needed and gently scraped up with a plastic edge. However, preventive measures should be taken at all times. Avoidance of debris tracking into the area can be limited with door mats, and area rugs can be used in areas of higher traffic but should have non-skid pads beneath them. Scuffing and scratches should be avoided by using furniture protectors on all weight bearing points, and they can be corrected with a color-fill marker. If you have a pet, its nails should be regularly trimmed. Following these simple recommendations should prolong the life of your floor, and keep it beautiful for years to come. This article is penned by Lora Davis for Finish Line Floors, a Brooklyn Park, MN based who are commercial & industrial flooring contractors. At Finish Line Floors, they have revolutionized the world of floor care with our innovative floor finishing solutions.